My lands are where my dead lie buried. My last post was written with a sad heart. Pine Ridge Reservation will bring down even the most optimistic of people. I have to say that I slept well and was not delivered of dreams, either of blue-eyed prairie women or sad-eyed Sioux. I needed the rest. It had been a grueling day. Today we went north to visit two sights that are perhaps some of the most popular in the region. Our first stop was Crazy Horse Mountain. Now, when I came through here in 1964, this attraction did not exist. The big draw then was a few miles further north, Mt. Rushmore. 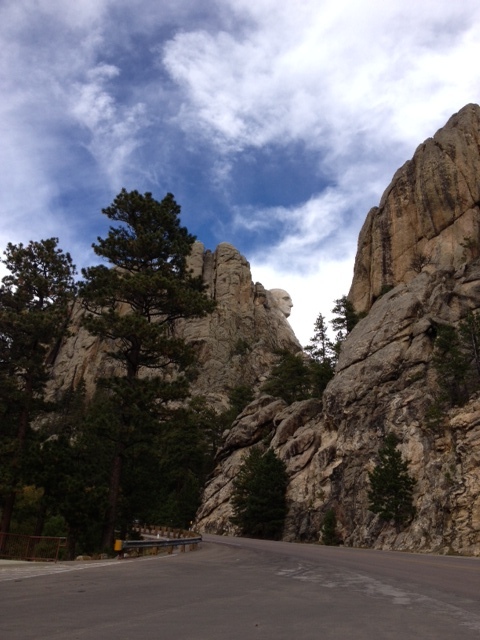 On Rushmore, there are the heads of four white Presidents. The Father of Our Nation, an early President who owned slaves, had children with one of them–and still went on to write the Declaration of Independence, a Trust Busting National Leader who set in place the National Park System, and of course, the Liberator of slaves (who never could admit the actual human equality of the African-Americans). Yes, these gentlemen put together a great nation and yes, they were extraordinary individuals by any standards, but they were white men and their faces were to reflect a new nation. But, where were the women? the blacks? and the others that built the nation with their backs, their sweat, there tears and their lives? Ok, a monument to a nation with four symbolic figures to stand in for the masses. I can deal. One mountain gone–one monument raised. This one is done for all practical purposes. As much as the Right would like it, I doubt that Ronald Reagan will ever adorn the facade, joining his fellow Chief Executives (most of whom he would argue with under the moon of the Black Hills). A few miles south is another project all together. This one, dedicated to Crazy Horse is not nearly finished. This figure is intended to dwarf all others. It will be the largest sculpture in the world. It was begun decades ago by an assistant to the guy who carved Rushmore. The figure will be of a mounted Crazy Horse with his arm outstretched over his horse’s head. He will be pointing to the distant horizon…where his dead lie buried. It’s worth noting that Crazy Horse, the Noble Chief of the Plains, was stabbed in the back and killed by an American soldier in September, 1877, (only twelve years after the North defeated the South in a struggle for, in part, the freedom of men). When we entered the Crazy Horse Mountain visiting center, it would cost me $20.00. I was a bit miffed at the fact that this fee was charged. Only later did I find out that it is privately owned and operated. When finished, it will be a huge complex dedicated to the education, arts and cultural of the American Indian. The people in charge wanted no government money. After returning to Custer, S. Dakota, where we were camping, I took a walk through the woods to reflect on what I had seen today. Here we had not one, but two, TNT blasted mountains. I thought about this. Actually, this was not without precedent. After all, there were gigantic Buddhas carved in a mountainside in Afghanistan (that the Taliban blew up a few years ago). I’m sure there are more examples throughout the world, I just can’t think of them right now. I’m leaving South Dakota tomorrow for Devil’s Tower, Wyoming. Now here’s a mountain that nobody has touched, yet. It’s a mystical place, I hear. Spielberg used it as the site of the landing of the Mother Ship in Close Encounters of the Third Kind. I’ve seen the Tower before. The only human interaction there was the rock-climbing. I don’t know. Maybe more is less–or less is more. 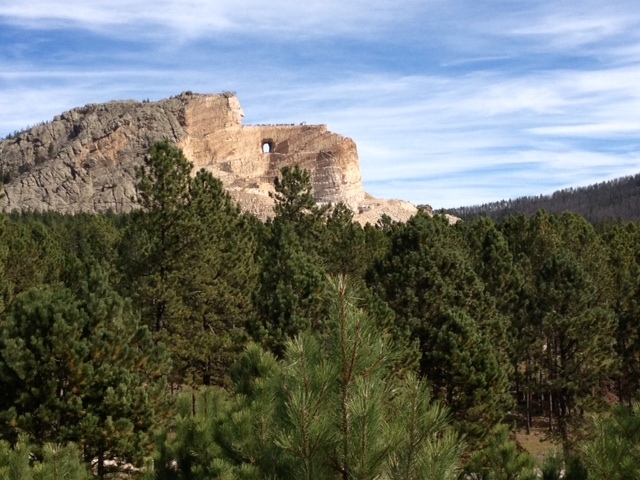 This entry was posted in Travels and tagged Afgan Buddahs, Black Hills of S. Dakota, Crazy Horse Mtn., Custer SD, Mt. Rushmore.